UPDATE: The Planning Board has unanimously rejected Meridian's proposal for 4 Bethesda Metro Center. Board member Jean Cryor says the building "overshot the mark. I am not opposed to seeing more development right there . . . But this building a couple of feet away from another building isn't it." We know, Bethesda is NOT East County. But there's a photo of Downtown Bethesda in my room, one taken inside 3 Bethesda Metro Center, from which you can see the Silver Spring skyline. It's a view that may or may not exist in a couple of years. When I was asked to write this piece, all I had to do was look at my wall and I said "yes." 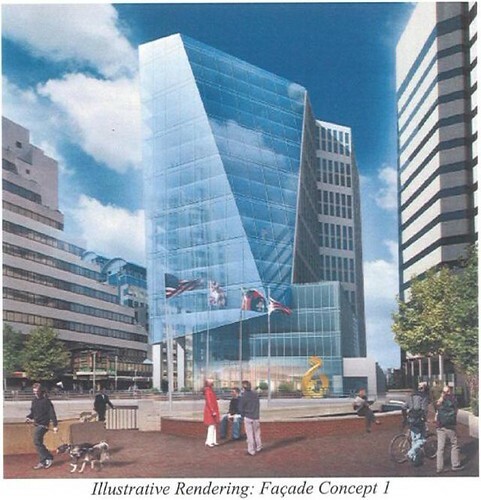 A rendering of the Meridian Group's 4 Bethesda Metro Center, a controversial proposed office building in Downtown Bethesda. Clark Enterprises, who owns 1 Bethesda Metro Center (at right), claims the building violates zoning restrictions. Two summers ago, I interned at an architectural firm in Bethesda. 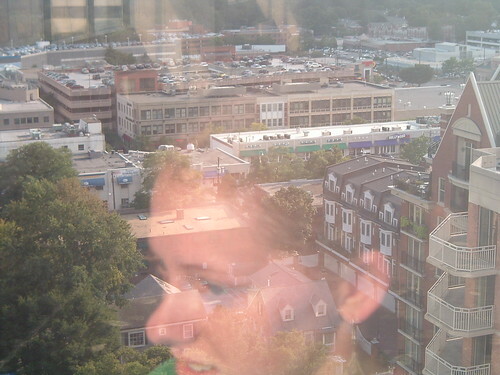 Our office filled the entire floor of a building downtown; from one side, I could see out to Tysons Corner, and from the other, to Downtown Silver Spring. Staring out the window proved to be an excellent way to fight boredom. This week, the Planning Board will look at a proposed office building in Bethesda that could change the way Montgomery County’s downtowns are developing – and the way many office workers waste their time. 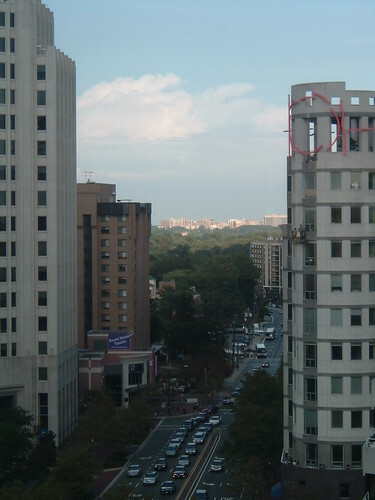 Looking east from 3 Bethesda Metro Center towards Downtown Silver Spring in 2005. Most or some of this view would disappear behind 4 Bethesda Metro Center, if built. But the view isn’t the only reason why Chevy Chase Bank, along with local developers Chevy Chase Land Company and Clark Enterprises, are opposing 4 Bethesda Metro Center in what the Washington Post calls a "struggle among real estate titans." As Adam Pagnucco explains on Maryland Politics Watch, it comes down to the process. The six-acre block known as Bethesda Metro Center, with its four 1980’s-era concrete towers, has reached the maximum density for its site. Harris says a 1989 zoning law allows developers to include “any land attributable” to a property, including surrounding streets. Old Georgetown and Wisconsin are “public use easements,” he argues, given to the State and County to use but legally owned by Meridian, providing the additional land to give them a density bonus. The method’s legality has been controversial. “We don't think it has any merits,” says communications director I.J. Hudson, representing Clark Enterprises, owners of 1 Bethesda Metro Center. “There were trails here before there were property rights,” he adds, pointing out that Wisconsin Avenue was once a Native American trail. 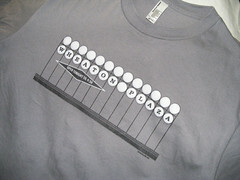 Hudson, who was a Channel 4 anchor for over two decades, works for Garson Claxton, located a few blocks away. He’s no fan of the Metro Center’s aesthetics – white concrete and tinted glass – but he and his client remain faithful to the project’s original vision. The Bethesda Metro Center plaza, seen from ten stories up. Saul's Chevy Chase Bank towers are to the left, and the BMC food court is at the bottom. For over a year, Sloan and his staff worked with the developers, wrangling as best a product he could from their vision and what the zoning would allow. “We all had concerns about several things about the project, in the building, and typical review process we get input from all the divisions,” Sloan says. Last fall, a series of memos were circulated by one staff member who argued that the proposal would burden local infrastructure without providing enough amenities. In response, Sloan made sure that Meridian would keep its promise to activate the windswept plaza below. As for the views? “The building is quite narrow, so it's not going to completely block it,” he offers. 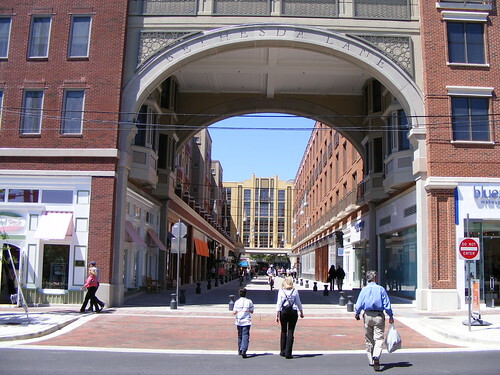 Recent developments like Bethesda Row and Bethesda Lane (pictured) have drawn customers away from the nearly thirty-year-old Metro Center. To keep visitors from slipping away to Bethesda Row, Meridian promises “significant improvements to the plaza itself,” Harris says, including “landscaping and greenery” and “new water features that will draw people in.” The bus terminal below will be revitalized with artwork and new lighting. 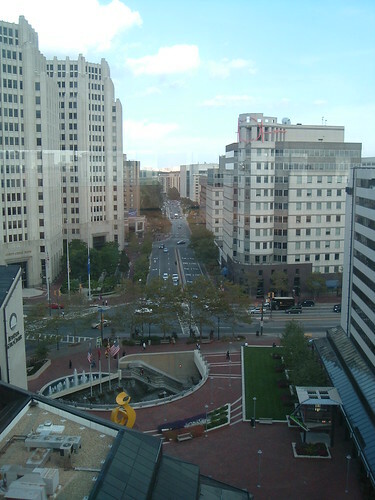 Looking southwest from 3 Bethesda Metro Center, towards Bethesda Row. Is Bethesda "Up the Pike"? The last thing we need in Bethesda, Silver Spring, Rockville and other nearby areas are more high rises. High rises equal more traffic, crowds, noise, pollution-- We are creating concrete monsters that will eventually become monuments to the narrow thinking of the crazed developers and the followers of Smart Growth. We do not need more people in the county and we do need more offices-- let them head out to the other counties, that could use the growth-- I have lived here for 40 years and I dread going out to the malls, because of the crowded conditions-- the Metro- over crowded- what ever happend to the suburbs being places of refuge from the rat race of the city. Who wants to see the sh*tty skylines of Tysons and Silver Spring anyways? Population growth is an immense concern, as is the growth of "urbanism". There are positive aspects to concentrating humanity in ever-more-dense centers. Yet there are dangers, as well. "The logic of urbanization is clear--those countries that urbanized most in the past forty years are generally those with the largest economic growth. Urban areas, generally, provide the economic resources to install water supply and sanitation, but they also concentrate wastes. Where good waste management is lacking, urban areas are among the world's most life-threatening environments (UNWWAP, 2003, p. 15)." Add to this the declining availability of cheap energy to transport food into urban areas, and to transport waste out of urban areas, and even more hi-rises sounds perhaps a bit risky. UNWWAP (United Nations World Water Assessment Programme) (2003). We are creating a Ponzi Scheme with this high density idea. We need more revenue- in order to maintain the budget- we can not tax anymore-- so we build more apartments and high rise condos- more people move to the area- tax base increases-- more people- means we need more government services- the budget increases again- does the County dare raise taxes again-- or--- do we build more high rises. So on and so on and so on!!!! RE: Then maybe its time for you and the other Maryland Haters to leave the state and let the people develope Montgomery County continue to grow into the 21st Century with Modern High Rise Office Buildings, Upscale Retail, and Better Maintain Highways. RE: Theres always Gambling Casinos. So Anonymous-- If one does not agree with the current policies- one is deemed a Maryland Hater. I do not hate Maryland- I do frown upon the moral cowards who hide behind the cloak of "anonymous" while they condemn those of opposing views..
What are you afraid of--do you thinkyou are so famous that you can not reveal your name-- or are you one who will profit from this headlong rush to disaster?? Only cowards and those who have nothing useful to say will hide behind the cloak of "anonymous". Maryland in general, and Montgomery in particular, does not need anonymous cowards. RE: Just like a Maryland hating jackass to intimidate and Bully those who call out on your Maryland hatred through your filthy rants against Modernising Maryland to compete with Northern Virginia's Economic, Business, and Revenue Growth. Again if you can't stand the thaught of Montgomery County growing at the scale of Northern Virginia then whats the point of you staying in Maryland thats if you really are a true Maryland Tax Paying Resident in which I am begining to Doubt. Only Maryland haters will find every freaking excuse to stop ALL FORMS OF MODERN 21ST CENTURY UPSCALE(OFFICE, RETAIL, AND MCMANSION) DEVELOPMENT AND HIGHWAY BUILDING. While at the sametime excusing Northern Virginia for being successful for Accelerating 21st Century Upscale Development and Highway Building. 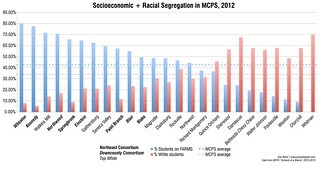 I guess the main goal is to chase out as many Middle Class and Upperclass people from Maryland as Possible(in hopes that they will migrate to NOVA) with the Beauracratic and Communist Laws supported by the Anti-Growth Anti-Progressive Powers that be.